The boundaries in the innovation landscape separate the known from the unknown, they divide the landscape into quadrants of different levels of certainty. 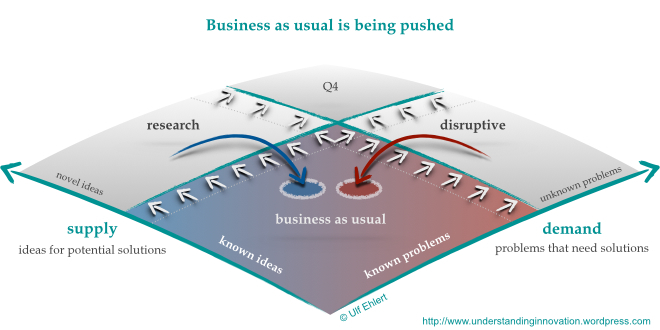 Unlike the research quadrant and the disruptive quadrant, which both have known and an unknown facet, the first quadrant (business as usual) is framed by known problems and known ideas. In this part of the innovation landscape, rules and tools are defined and available. Innovation under these conditions is focused on developing solutions for known problems by recombining known ideas in novel ways. This is the realm of comforting certainty, of predictable circumstances. That is what makes this quadrant the natural habitat for organisations. Through their structures and processes, organisations embody the rules and institutions that society established for dealing with the known problems. At the same time, organisations attract and absorb the known ideas and available resources; they strive to allocate these resources in the most efficient way for achieve their objectives. No big wonder that the first quadrant is the domain of companies. Seeking to reduce their transaction cost, companies are driven by efficiency. In the innovation landscape, this focus results in what Clayton Christensen calls efficiency innovations: delivering products or services at reduced production cost, increasing profit margins without increasing the functionality or utility to the customer. Innovation under the conditions of business as usual is always looking for the safe bet, trying to minimise risk; it actually promotes a risk-averse attitude. That is the price that companies are willing to pay in order to maximise efficiency and to generate innovation at superior speed. The certainty of rules and tools allows them to develop and implement a novel solution significantly faster than what is achievable under the uncertain conditions outside business as usual. Unlike innovation in the second and third quadrant, innovation in business as usual does not push the boundaries in the innovation landscape. In fact, innovation in the first quadrant cannot overcome its own limits, because the novel ideas and the unknown problems are addressed outside. Rather, the first quadrant depends upon the external pushes to have its scope expanded. Left to its own devices, the first quadrant would just become an optimisation exercise under known boundary conditions, at risk of reaching saturation. Without external pushes of the boundaries, diminishing marginal returns in business as usual would make ever smaller improvements ever more expensive; until the return does not justify the investment any more. To avoid that “innovation arrest”, the first quadrant needs the transfusion of novel ideas and novel problems that can only be generated outside its own boundaries. Innovation in business as usual does not push the boundaries; rather, its boundaries are being pushed from the outside. P.S. This is the third in a series of posts on pushing the boundaries in the innovation landscape. The previous posts addressed the second quadrant (research) and the third quadrant (disruptive). The series will close on the wicked fourth quadrant. Excellent and thought provoking series. Most of the times, our habit of remaining cocooned in our comfort zone does us in. Thanks a lot for the encouragement. Cocooning and the related myopia were at the back of my mind as this series emerged; I’ll seek to develop the ideas further and cast them in a future post.